Musician Michael Holt, based in Toronto, is planning for a forthcoming musical tour. 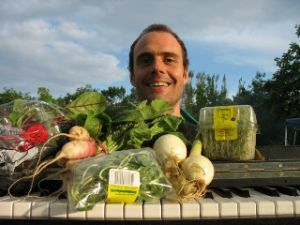 He’s aiming for 40 participatory, community building events to Initiatives as part of his ‘Transition Culture Tour’ which will take place from June 7 to July 22, 2012 across parts of Europe. So far, Michael has some events booked in parts of Sweden, Germany and Belgium and is hoping to connect and collaborate with many more Initiatives too. You can find out more about the planned tour, locations and dates, links to his music and more about Michael and how to contact him here – Transition Culture Tour Project page; and below is a brief introduction to the tour. Celebrate Transition with my music. Learn about the movement through first hand experience, and share this experience everywhere I go. Introduce local initiatives to a variety of replicable, participatory gatherings which can nourish project resilience, create dialogue, and build local culture. Explore the concept of Transition Culture and what that can mean. If you would like to connect with Michael regarding planning an event for your area, you can contact him via the links in the ‘How to get Involved’ section on the Transition Culture Tour project page.